All families have their fair share of secrets. But it’s when they come out that defines how thick the blood is. Family Furniture by A.R. Gurney is a delicate family drama that touches on the value of parent and child relationships when all is revealed one fateful summer. When siblings Nick and Peggy discover that their mother may be cheating on their father, they struggle between sparing their father or maintaining the status quo. Set in the early 1950’s, Gurney and director Thomas Kail tread finely between drama and soap opera, as many secrets get unearthed simultaneously. 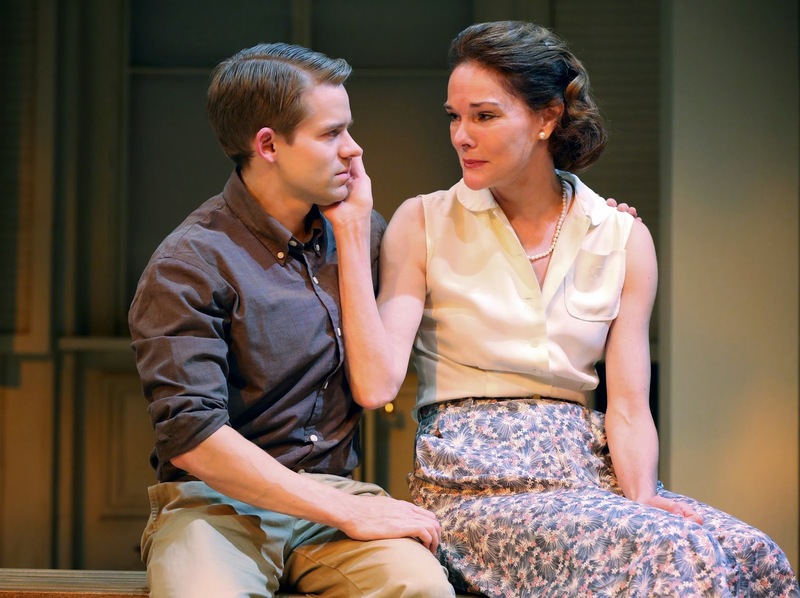 The focal point of the play is about the affair, but along the way, tiny subplots pop up attempting to distract the monotony of repeating the same conversation. While the play could be trimmed to avoid inevitable repetition, what Gurney does offer is strong. The ensemble of five does a fine job getting the 50s in their body and voice. Carolyn McCormick is divine as Claire, the classic desperate housewife. The final scene between her and Nick, played honestly by Andrew Kennan-Bolger, is the best moment of the show. McCormick pours her heart and soul into the scene, ending with the defining line of the play, “People can know and not know, Nicky. And still get along famously” with a triumphant beam on her face. Peter Scolari as Russell plays the optimistic pessimist father sublimely. Scolari survives through the truth he keeps suppressed quite possibly making him the strongest character on stage. Ismenia Mendes is sweet and genuine as Peggy, the girl with the dashed dreams. Claudia Brown’s costume design evokes the period of the play. She does a wonderful job making McCormick look stunning from scene to scene. Bart Fasbender’s music during scene changes is fitting. For the most part, the play is set at the family’s summer home, with various corresponding locations. With the confines of space, set designer Rachel Hauck created a simple world where various size wood benches serve as all of the family furniture. Hauck and Kail rely heavily on the audience to use their imagination to see the upper-class household. While the esthetic is clever, it does seem to be a cop out. Additionally, the large column in the downstage left corner is more obtrusive than a defining location divide. For those who enjoy Gurney and plays of this style, Family Furniture is a beautiful piece. What Family Furniture offers is a throwback to another time. What it lacks is poignancy. What was a scandal in the 50s is unfortunately common practice today.